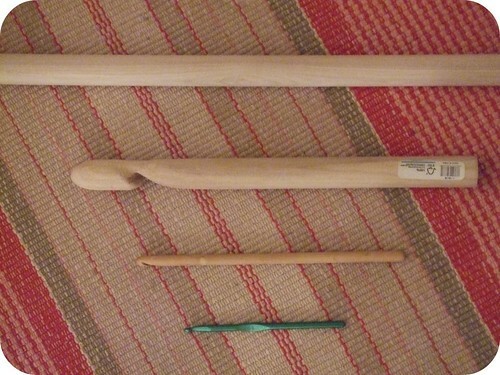 When it comes to crochet hooks, size matters. In starting this project I thought to myself, I’m going to need a really big crochet hook. I went to Home Depot and bought their biggest wooden dowel, a rasp and a sander sponge. Above is a picture of the dowel, the resulting hook, a hook I had previously thought was pretty big and the green hook that I carry with me just in case I have time to get a little crochet in on the subway. When we finished the cord I realized if I was going to crochet with a hook it would have to be made from a tree trunk! 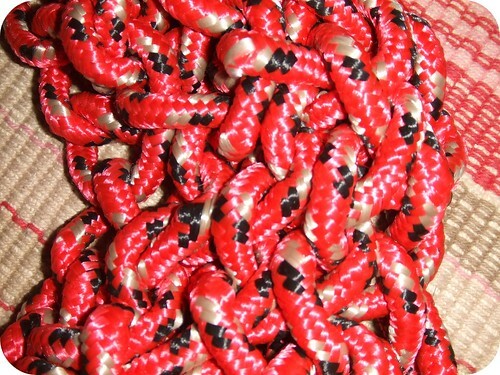 After some experimentation I found that using my hands was better since crocheting that dense, huge cord it more like wrestling. 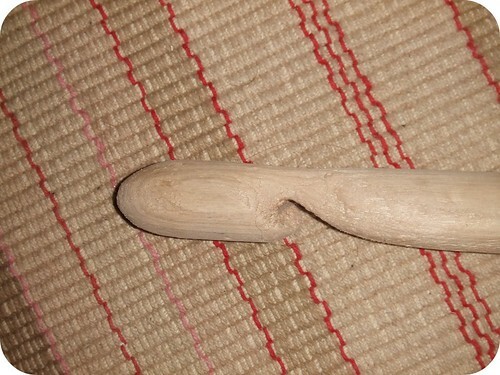 Above is a close up of the hook I whittled in July. It can only crochet about a 3/4 inch piece of rope. I went back to Home Depot, the employees there think I’m a little weird, and bought a bunch of hiking rope to experiment with. As my first foray into single item oversized crochet I was really excited to find that it works! 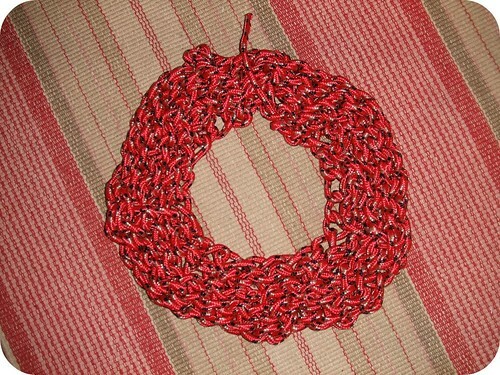 Above is the result of those efforts — as my mom pointed out it looks like a hiking rope wreath. If anyone knows an adventurous sports fan who wants a recyclable, reusable, non-plant based wreath for Christmas just let me know, I’ve got a gift for them! This entry was posted on Saturday, September 12th, 2009 at 7:10 pm and is filed under Material and Process. Tagged: Crochet, Hiking Rope, Hooks. You can feed this entry. You can leave a response, or trackback from your own site.